At 32 weeks I was told that my baby was in breech position, which threw me into a spin as I was aware that this would jeopardise my desire to have a home birth. The midwives confirmed that I would not be able to have her at home and the hospital policy was to recommend a Caesarean Section if she remained breech at or near term. My husband and I then spent the next four weeks trying every remedy under the sun to get her to turn. I had acupuncture and then we spent 20 minutes twice a day burning moxibustion sticks near my little toes with me lying with my bum elevated on lots of pillows. The only outcome was that our house smelt like a drug den, I had little burn marks on my toes and my husband nearly died of asphyxiation. She did move a lot but no somersaults. I tried homeopathy, positioning, cranial osteopathy and visualisations – nothing worked. At 35 weeks I had a scan which confirmed the breech but also that she was a Frank breech which is folded in half with head and feet under my ribs, not very comfortable but good news because this is the best birthing position for a breech. The hospital were still trying to convince me that a C section was my best option and the pressure they exerted was very difficult to withstand especially when they played their trump card and said “well if you want to risk the life of your unborn baby…..”. By 36 weeks and having done a lot of research into breech births, we decided to hire independent midwives and still attempt the natural home birth. I had read Maggie Banks’s book, Breech Birth, Woman Wise and conducted my own research into the Term Breech Trial and found that it had been flawed in its methods and conclusions. Even though I hadn’t birthed before, I trusted my body and I knew that with effort and action I could create the birth I wanted. We hired two beautiful midwives from a private midwifery practice and between them they had lots of experience delivering breech babies naturally. I did not want to do an ECV as I had not heard any good reports about this procedure to artificially turn the baby and there I chose to use acupuncture with my midwife to attempt a natural turning. Although the midwife was able to get her out of my pelvis twice, both times she sat straight back down again. My midwife looked at me and said this baby does not want to turn. At this point we gave up on trying to turn her and decided that she had chosen this position for a reason and we had to trust that she knew what she was doing. The independent midwives had said that it was black and white for us, either everything went according to plan or there were complications and I was straight into hospital for a Caesarean. By 40 weeks I was feeling very confidant that everything was going to be fine. I went into labour spontaneously on my due date and my waters broke around 1.30am. We called the midwife and by the time she turned up at 4am I was 5cm dilated and about to get into my birthing pool. Labour progressed quickly and in another 3 hours, I was fully dilated. At no stage did I feel the need to ask for pain relief! I had to get out of the pool for second stage because of the breech. I was in second stage for just over 2 hours when her bum finally descended into the world. 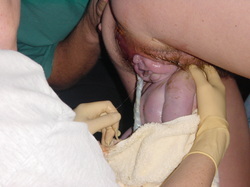 It took a few more minutes of pushing to birth her in stages and she began to breathe immediately her mouth and nose were out before the head was fully delivered. She came out kicking and had an apgar score of 9, which is fantastic for a breech delivery. My perineum was intact and my placenta delivered naturally 15 minutes after the birth so we managed the whole thing with no intervention, no drugs and no stitches. In no time we were both enjoying a delicious bath and afterwards were tucked up in bed together feeding and sleeping. The wonderful thing about having a home birth was that we were able to relax and create the perfect environment with our favourite music playing, candles, aromatherapy oils and dimmed lighting. The setting was intimate and I was able to have my Mum and my best friend supporting us as well. My husband and I were delighted that we had managed to withstand the pressure and have the wonderful natural birth that we had dreamed about. I was feeling empowered and like I could do anything. In the following weeks as I listened to other women recounting their traumatic, pain filled and surgical births, I felt so sad that so many women didn’t know that birth could be so transforming and so ecstatic. I am so grateful for all the support I received to achieve this beautiful natural breech birth.